Title: Happy Birthday to You! Publisher: New York: Random House, 1959, 1987. Synopsis: The Great Birthday Bird and the Katroo Happy Birthday Asso-see-eye-ation combine to celebrate the most glorious birthday of all, the day you became YOU. Dr. Seuss’s trademark nonsense-verse that makes a great deal of sense, and his fantastic fantasy illustrations combine in this flight of fancy party with amazing presents and unheard of treats. 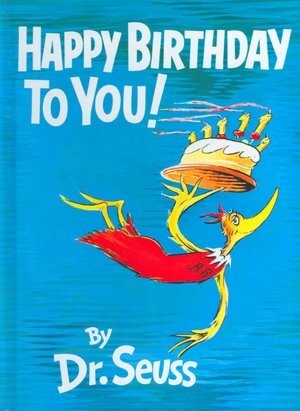 All the fun and the silliness of a typical Dr. Seuss book are here in abundance, and will delight children – but the message “There is no one alive who is you-er than you!” is the reason this book has won its place in my heart, for all time. What a great thing to celebrate! Kids so often feel that they aren’t as good as someone else, or they try to be someone else, and it is crucial to celebrate who they really are. This book can help. Personal Note: I don’t know why, but I had no Dr. Seuss books when I was a child (despite the fact that his books were certainly available during my childhood). I first encountered Happy Birthday to You! when our church minister read it as a children’s story in church when I was eleven or twelve (or perhaps even more). (Thanks, Ken!) I immediately loved it for its celebration of each child’s uniqueness, and have loved it ever since. What a great book for today (my son’s birthday!) and I’d never heard of Dr. Seuss when I was young. Thanks, Catherine! Hope your son is having a happy birthday! Oh, the “Butter Battle Book” is super! Thanks, Erik! This is a Seuss book that I haven’t read, and I have read many! I confess The Cat in the Hat was one of the few picture books I owned as a a kid. I have yet to read The Cat in the Hat! Thanks, Joanna. I vaguely remember reading this. I didn’t own many Dr. Seuss books as a child, but my younger siblings did. I may have been older. This one sounds like a lovely book with such an important message for children! I like your suggestions for activities — good idea to have kids tell another child what they value or like about them! What a special gift! My birthday was this past Sunday, so this is the perfect post for me 🙂 I love this book! And it does make a great gift also. Thank you for your review, it was great! Oh, good! Happy birthday again! (Mine’s just around the corner, which is what made me think of this book.) Thanks, Loni! Beth – I also came late in life to Dr. Seuss. My cousins in Chicago (the big city) had them. The first ever one I read was Horton Hears a Who. I don’t think I’ve read this one., will have to look it up. And like Loni, my birthday is just around the corner – how appropriate. I think you’ll like this one, especially the “You are YOU!” part. My birthday’s just around the corner as well, so that’s why I had this book on my mind. Happy birthday ahead of time, Laura! I think a Seuss book comes with being born in the States – I am sure every family gets at least one with each kid! Right? It’s in the Constitution, I’m sure! I never saw a Dr Seuss when growing up. They are everywhere now though, and lots of fun to read. Great message! Happy Birthday to you and the other soon-to-be Birthday celebrates! I *think* I’d seen them when I was a kid, just had never read them! Thanks for the birthday wishes! This is one Seuss that I haven’t read! I will have to see if the library has it. Thanks for bringing it to my attention, Beth. You’re welcome, Penny! Hope you find and enjoy it! It is interesting reading all the comments here. Lots of birthdays! Mine is in 1 week! Yay me! And I’m surprised at all the adults who didn’t grow up with Dr Seuss! My Mom Person says the very 1st book she learned to read was the Cat in the Hat. And I know that her kids grew up with Dr Seuss. And still have a passion for his whimsy. His books are staples in our house. Nice choice from you! Thanks for sharing! Thanks, Rhythm! And happy birthday ahead of time! Hope you get lots of treats that day! It is amazing to me how much children today –including mine– adore Dr. Seuss. This one is new to me, though. I wonder if our library has it. I hope your library *does* have it, Kirsten! I think your guys will enjoy it! Wow, I’m amazed there’s a Dr. Seuss book that I’ve never heard of! Thanks for pointing this one out, Beth.